I first heard Swedish band Miss Behaviour back in 2011 when I saw them play live with Houston, Crashdiet, Serpentine and Vega - one hell of a strong lineup. Despite the strength of the other bands, Miss Bheaviour really stood out and impressed me with their great melodic rock songs. 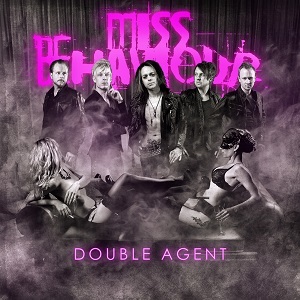 It's been a long wait since their last album (2011's Last Woman Standing), but now the wait is finally over as the band have just released their new album, Double Agent. The new album sounds great - while some melodic rock is bland and has forgotten it's supposed to be rock, Miss Behaviour have released an album that's got a strong rock base with the vocals and the light keyboards making sure it's radio friendly Melodic rock and doesn't stray too far towards hard rock. The vocals are excellent - the fairly high male style of vocals that are typical for the genre, and have plenty of power when needed but are nice and smooth when that suits the song better. There's some great guitar work, and the guitars are fairly prominent in the mix. The keyboards give a light smooth sound that is clearly audible but isn't so high in the mix that it distracts from the guitars or vocal. It's not all fun and catchy AOR/melodic rock songs - they've also thrown in a semi-acoustic ballad, "Corporation arms". There's a mix of electric and acoustic guitar. It's a great song and is a nice change of pace. Check out the video below. If you're a fan of AOR or Melodic rock then this is an album you really need to listen to. Highly recommended.